Three students from 9L were finalists in this year’s Slade Literary Awards, a writing competition that has been run for more than twenty years by Richmond Rotary Club. The topic this year was ‘Making a Difference’ and Hoangan Le, Henry Mann and Vlad Monakhov all received certificates of merit for their essays. Hoangan’s essay, ‘Second chance fairy’ was about Nobel Peace Prize winner MalalaYousafzai; Henry’s essay was about the difference that can be made by quantum computing; and keeping with the technological theme, Vlad’s essay was titled ‘How the internet changed the world.’ Henry was performing in the Winter Concert, so was unable to attend the awards night, but Hoangan and Vlad were able to experience the event and meet the other finalists. Congratulations, Hoangan, Henry and Vlad! Thanks to Mr Blair Mahoney for organising this opportunity for our students. 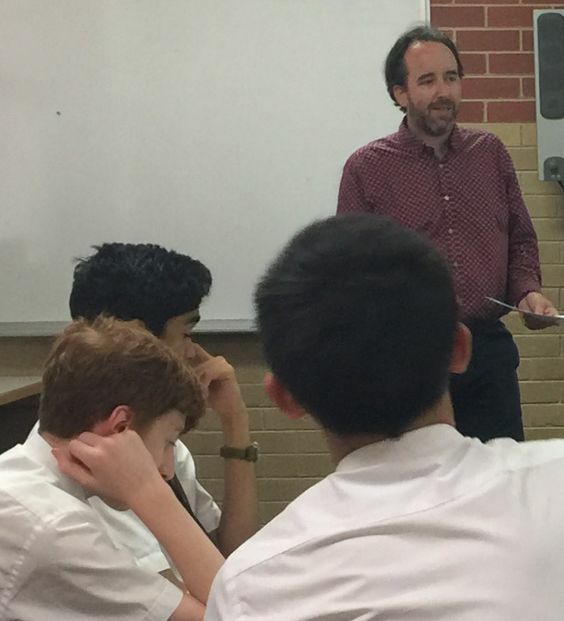 To celebrate World Poetry Day, Mr Blair Mahoney talked about “how to read a poem” today as part of our Ten Minute Tuesdays series at recess. Mr Mahoney encouraged us to enjoy the poem without having to understand all of it. Mr Mahoney read “Cartoon Physics, part 1” by Nick Flynn after he talked about poems sometimes having personal meaning for people at different times of their lives. only he can pass through it. until he notices his mistake. After sharing some tips for reading poetry out loud, Mr Mahoney read out “In the Park” by Gwen Harwood, demonstrating paying attention to punctuation and run-on sentences. Someone she loved once passed by – too lateto feign indifference to that casual nod. Thanks to Mr Mahoney for his engaging session and expertise. Thanks to all who came; I’m sure you got the most out of ten minutes of your recess on World Poetry Day. 10 minute Tuesdays have started! This year the library is running short topical sessions in the GLC at recess on Tuesdays. About 10 minutes long, the topics are varied, so we’re certain you’ll find something of interest. As a special consideration we are permitting food to be eaten during this session. We kicked off the series last Tuesday with my presentation on “How to Spot Fake News” which was well received (as far as I could tell) – something we hear a lot about these days, sadly. These sessions will sometimes take a lecture-style format, and other times they will be more interactive. They will all be short and sweet so please come and sample.